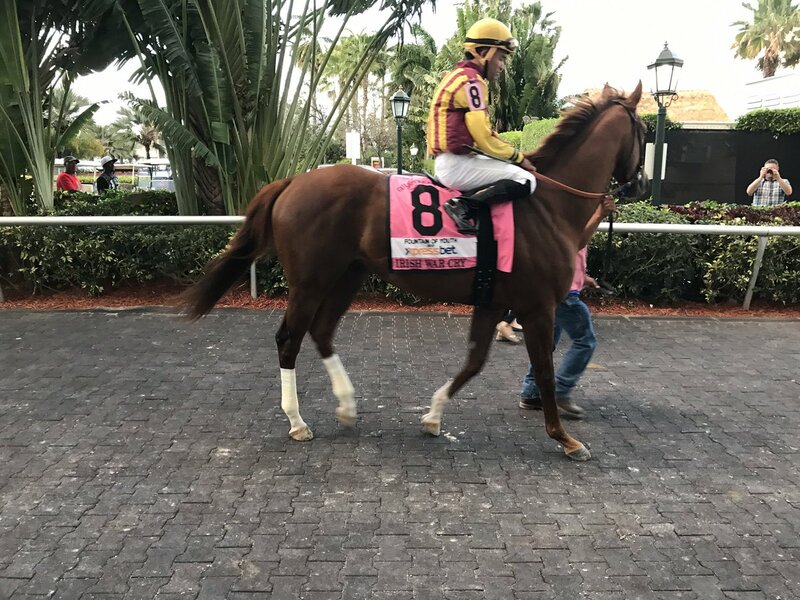 Irish War Cry (photo by Jonathan Stettin). COMMENTS: Unbeaten in three starts, including Gulfstream Park’s Grade 2 Holy Bull Stakes on Feb. 4, Graham Motion’s charge threw in an inexplicable clunker when finishing more than 21 lengths behind Gunnevera as the favorite in that track’s Grade 2 Fountain of Youth Stakes on March 4. Irish War Cry redeemed himself with a solid win in Aqueduct’s Grade 2 Wood Memorial, in which he equaled his previous best Beyer Speed Figure of 101 earned in the Holy Bull and picked up 100 Derby qualifying points to add to his 10 banked in that race. The homebred’s sire, Curlin, competed in all three 2007 Triple Crown races, running third in the Kentucky Derby, winning the Preakness Stakes and finishing second the Belmont Stakes, en route to consecutive Horse of the Year honors. Irish War Cry returned to Motion’s barn at Maryland’s Fair Hill Training Center on the evening after his Wood Memorial victory and is slated to have one work there before shipping to Churchill Downs on the Sunday or Monday prior to the Run for the Roses. Jockey Rajiv Maragh, who was sidelined for nearly 16 months due to injuries suffered in a July 10, 2015, spill, rode Irish War Cry for the first time in the Wood and is expected to retain the mount in the Derby. Can Terra Promessa Be Beat in the Azeri? Bet On It!